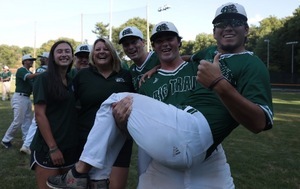 Big Train players Carlos Lomeli, Chris Clarke and Ryan Metz pose with athletic trainer Kristi Voight and intern Devon, as head coach Sal Colangelo photobombs. After finishing the regular season with a 34-6 record, Bethesda Big Train is focused on winning their third Cal Ripken Collegiate Baseball League championship in as many years. But, the atmosphere of the club isn’t one of a team solely focused on the wins. The environment, described by outfielder Tyler Villaroman (University of San Francisco) as “competitive, without feeling stressed,” allows players to develop both on and off the field, creating bonds with ball players from all over the United States—often from schools that wouldn’t ever play each other. Players from across the country arrived in Bethesda, Maryland, at the beginning of June—many meeting each other for the first time. Of those players, approximately half have at least one college teammate on the Big Train. The University of San Francisco, the best-represented college in Bethesda, boasts four players on the roster. Historically, the San Francisco Dons have been well-represented, with a total of 19 athletes playing for the Big Train since its inception in 1999. Some players, from schools like East Carolina, Jacksonville and Waynesburg, are the only ones representing their team on the Big Train. In addition, infielder Tyler Reis (Waynesburg) is the only Division III player on the team. For him, being able to pick the brains of players used to a higher level of competition was important. Shortstop A.J. Lee (Maryland), a rising senior out of the University of Maryland, felt the same way. As the only position player from Maryland, Lee didn’t really know anyone when he arrived in Bethesda a week after most other players. He had no trouble making friends, though, in part because of the similar temperaments of his teammates. Two-way player Alec Burleson (East Carolina) arrived two weeks into the season, but felt welcomed right off the bat, as his teammates introduced him around the dugout. For him, it was the friendliness of his fellow players that helped him feel at home. The coaching staff, headed by Sal Colangelo, plays a big role in making the environment one in which players can thrive and develop, both on the field and off the field. Ensuring that the atmosphere is one of respect, both for the coaches and for the players, is important to Colangelo, who is in in his 14th year as head coach of the Big Train. To Villaroman, it is this approach that helps emphasize relationship-building among the players. The rising junior explained that the staff lets the players do their “own thing,” as long as it’s the right thing. From the get-go, the coaches didn’t set strict rules—they let the team play and develop their skills. Westerman added that because of the environment, players are able to talk more—and talk about things other than baseball. “It allows us to be more of us,” he said. This approach, as well as the team-run summer camp for children ages 5-12, has helped rising freshman Carson Taylor (Virginia Tech) get to know his summer teammates and develop before heading to college in the fall. “It’s been super easy because that laid back kind of feeling is what relaxes people, so it makes it easier to bond,” said Taylor. That bond is evident on the field, with players joking around in the dugout and bullpen, congratulating each other after hits and encouraging each other through slumps. Some players have even exchanged school shirts, with players wearing the shirts of colleges hundreds or thousands of miles from their own. With a bond that close, the Big Train’s outstanding season is no surprise. The team heads into playoffs as the number-one seed in the South Division, looking for the three-peat. But already, the team is record-breaking, setting a new franchise record in most wins, as well as setting league-wide records in walks (238), runs scored (326), on-base percentage (.413) and highest winnings percentage (.850).